Display your Kilner drinks dispenser with this Kilner stand while adding support. This practical metal stand elevates your dispenser and makes serving your homemade drinks a joy! 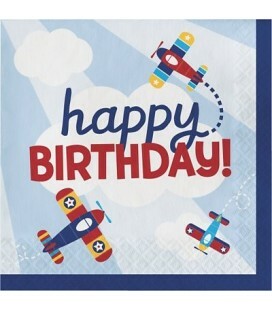 These Airplane napkins are perfect for all your future little flyers who will make your party fly high! 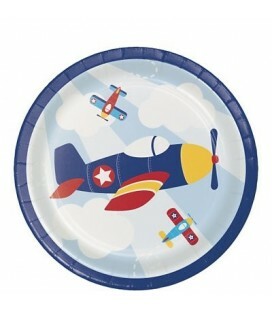 These Airplane cake plates are perfect for all your future little flyers who will make your party fly high! 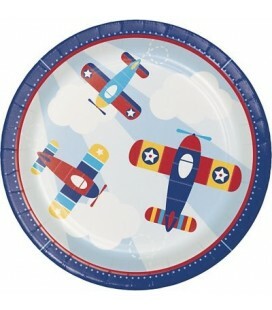 These Airplane Dinner Plates are perfect for all your future little flyers who will make your party fly high! 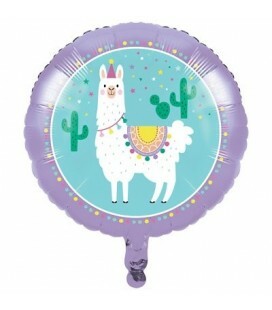 Add some llama cuteness to your party with these colourful llama party hats. They will make adorable and memorable party photos! What's a party without balloons? No other decorating staple is as fun and timeless as balloons. This balloon of our theme "Donut Party" makes a wonderful decoration, helping you set the scene at your party. This balloon features a donut shape with pink icing, sprinkles, and even a hole in the center that makes it look real! Helium inflated with Click & Collect : No thanks Oh yes ! Photobooth kit of 10 different props mounted on sticks. Fun to strike a pose and great for a flapper good time! Capture your big day with unique and delirious photos of your friends and family with this kit. Laughter guaranteed with the very young to the young at heart! This kit includes 10 different cardboard cutouts. Now, Everybody Say Cheese ! Each package includes 5 Lama Party danglers. 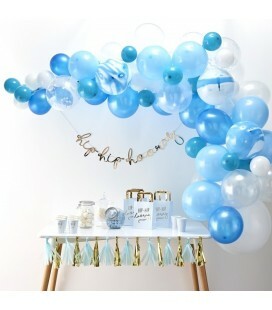 Hang them above the party table or anywhere you would like for whirls and twirls in the breeze! 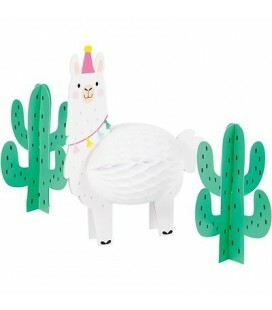 This Llama Party centrepiece set is perfect to decorate your table and your party room while putting your guests in a fiesta mood with it's cactus and cute llama. 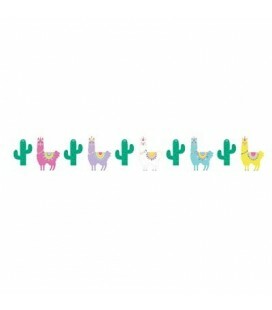 A cute and colourful cactus and llama banner of our Llama Party theme. This is fantastic to hang over an entrance or on the wall of your party room. A splendid way to welcome your cute little trendy llama lovers to your Llama birthday party! 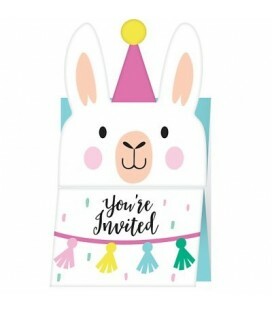 These adorable accordion style invitations featuring the coolest Llama will make your guests take out their pompons and maracas to join the party! It's fiesta time! 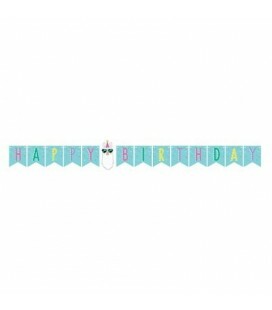 "Happy Birthday" Llama Party banner. This is fantastic to hang over an entrance or on the wall of your party room. A splendid way to welcome your cute little trendy llama lovers to your Llama birthday party! 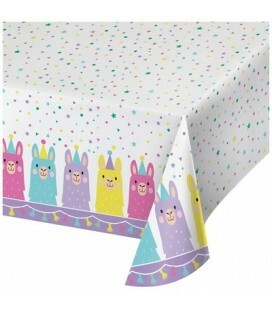 This Llama Party plastic table cover will decorate your party table while protecting it from any accidental spills. 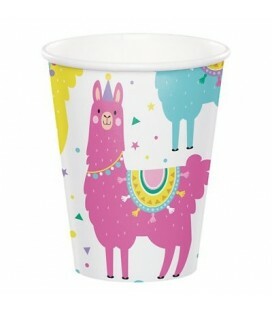 These cups featuring the cute and trendy llama theme bursting with pastel colors are perfect for any birthday. 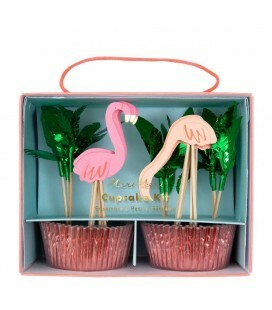 Such a fun theme that will brighten up your party with summery feelings! Get ready to fiesta! These napkins featuring the cute and trendy llama theme bursting with pastel colors are perfect for any birthday. Such a fun theme that will brighten up your party with summery feelings! Get ready to fiesta! 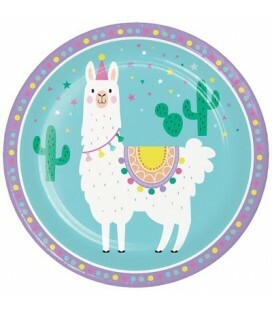 These plates featuring the cute and trendy llama theme bursting with pastel colors are perfect for any birthday. Such a fun theme that will brighten up your party with summery feelings! Get ready to fiesta! Piñatas are a great addition to any birthday parties as they are sure to put a festive touch. Find the magical ribbon that will open the hidden door releasing all the goodies such as candies, confettis or toys! Pinata fillers are sold separately. Decorate an Easter party with this wonderful garland Easter eggs in different prints. These premium, pure, no colour-added white sprinkles (also known as jimmies or strands) are the sought-after skinny sugar strands made in Canada. These sprinkles are candy-sweet and yummy on their own. These sprinkles are the perfect way to make any cake, cupcake, cookie, ice cream sandwich or pretty much anything party-ready. Each Ocean Party invitation package includes 8 invitations and envelopes. Your guests will not refuse this ticket to a fun-filled underwater party! 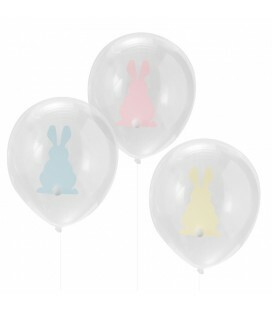 These super adorable pastel bunny balloons with cute pom pom tails are the perfect cute finishing touch for any fun Easter celebrations. These beautifully illustrated treat bags will transport you in the ocean waters. Stuff them with your favorite candies, party favors and a variety of our value party favors! Your guests will be ecstatic when they see they each have a treat bag full of goodies to take home! These beautifully illustrated dangling decorations will transport you in the ocean waters. 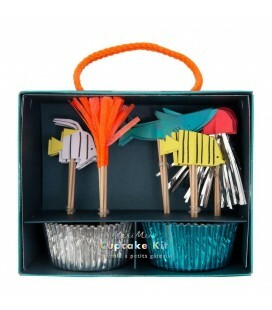 They will decorate your party room featuring lots of delightful sea creatures ! 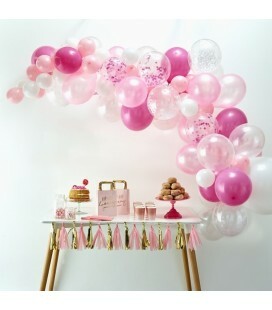 Hang them above the party table or anywhere you would like for whirls and twirls in the breeze! This beautifully illustrated centrepiece will transport you in the ocean waters. It will decorate your table and your party room featuring lots of delightful sea creatures ! This beautifully illustrated table cover will transport you in the ocean waters. It will protect your table from any stains and spills featuring lots of delightful sea creatures! These beautifully illustrated napkins are perfect for a party with an ocean theme. Featuring lots of delightful sea creatures ! These beautifully illustrated cups are perfect for a party with an ocean theme. Featuring lots of delightful sea creatures ! These beautifully illustrated plates are perfect for a party with an ocean theme. Featuring lots of delightful sea creatures ! 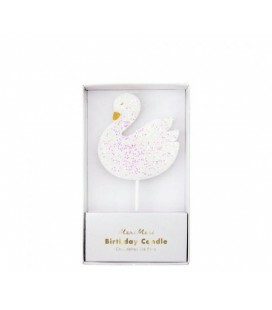 Make a cake look on-trend and colorful with this pretty glitter swan candle. 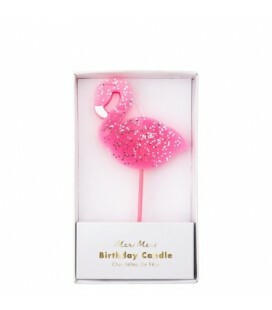 Add a fun and graceful sparkly touch to your party while blowing this gorgeous candle! These sparkly alphabet stickers are super for making posters, labeling gifts or customizing notebooks. A creative and festive way to add a shiny touch to your presents or decorations. Use them to write your name on objects or fun messages so they sparkle everywhere! 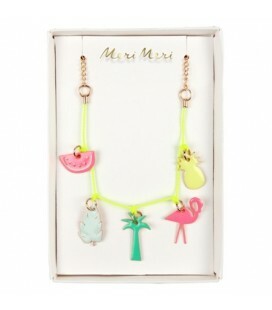 This cheerful and charming necklace from the trendy american brand Meri Meri will add a touch of originality to any outfit! A girly and stylish jewellery as we love them! 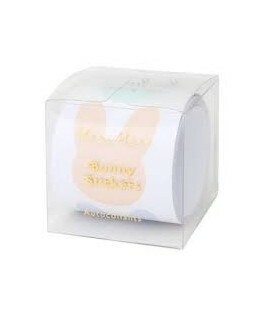 These adorable pastel coloured stickers have the cutest Easter bunny! A creative way to add a sweet touch to your presents. Use them to keep kids busy in a fun way at your Easter parties. These adorable pastel coloured stickers have the cutest Easter designs! A creative way to add a sweet touch to your presents. Use them to keep kids busy in a fun way at your Easter parties. These gorgeous bunny bags, with sweet little ears, are a brilliant way to present Easter gifts and delicious chocolates. Beautifully made from cotton in delightful pastel colors and embellished with gold detail. Comes with a sheet of neon coral tissue paper to use for wrapping. Bring Spring to the table with these beautiful Flower Garden napkins. Brightly colored with shiny goil foil detail, they'll look amazing at any gathering. If you want your party to be stylish and beautiful, then you'll love these rather special Flower Garden Napkins. Almost too pretty to use!